Catch so much as a glimpse of an Eddie Adams photograph and you'll never forget it. The late photographer snapped some of the most indelible celebrity images of the last twenty-plus years, from a portrait of perennial clown Jerry Lewis, half his face covered in grease paint, to a shot of Clint Eastwood taken from the back that became the poster art for his Oscar-winning movie Unforgiven. 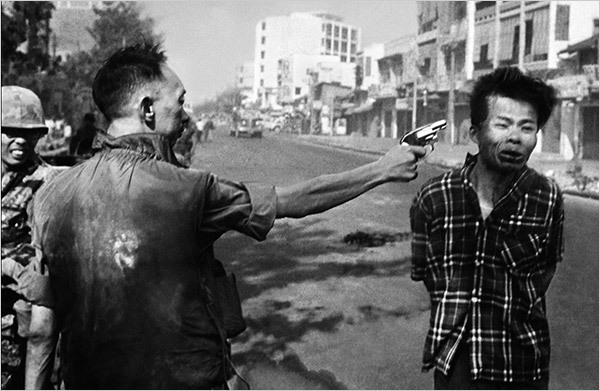 But the image no one could ever shake, not even Adams himself, was the photo of a Saigon police chief shooting a Vietcong guerilla point-blank. The horrible moment would become a symbol that solidified the image of an unpopular war with the American public. The new documentary An Unlikely Weapon: The Eddie Adams Story recalls the impact that photograph had on both the Vietnam War and Adams himself. The film -- which opened July 3 at the Starz Film Center in Denver and hits Los Angeles, Chicago, and other cities later this summer -- recalls Adams' body of work and the fascinating man behind the camera. The photographer worked his way up during the 1960s from one small newspaper to the next, but his talent ultimately earned him a gig with the Associated Press. He became one of many wire photographers assigned to cover the escalating war in Vietnam, a job which proved deadly for some of his peers. Adams earned the soldiers' trust by sharing the risks they endured, but it was his ability to sense -- and capture -- a critical moment which epitomized his gifts. Those images could shatter the heart, from wounded warriors on the battlefield to the innocents caught in the crossfire. While some of the talking heads assembled here, including former broadcast news anchors Peter Jennings and Tom Brokaw, spoke openly about how Adams' work impacted the anti-war effort, he simply wanted to take the best pictures possible. It's fascinating to watch the gaggle of old guard reporters recall Adams and his work. It's a who's who of questionable journalistic ethics, including Peter Arnett, whose work inspired a number of controversies, from sloppy coverage of Operation Tailhook to his pro-Iraq comments at the dawn of the Iraq War. 60 Minutes mainstay Morley Safer also salutes Adams here, in between drawing glib parallels between the Iraq war and Vietnam.